NEW YORK—Shen Yun Symphony Orchestra was an experience unlike any other for fine arts publisher and dealer Greg Smith. 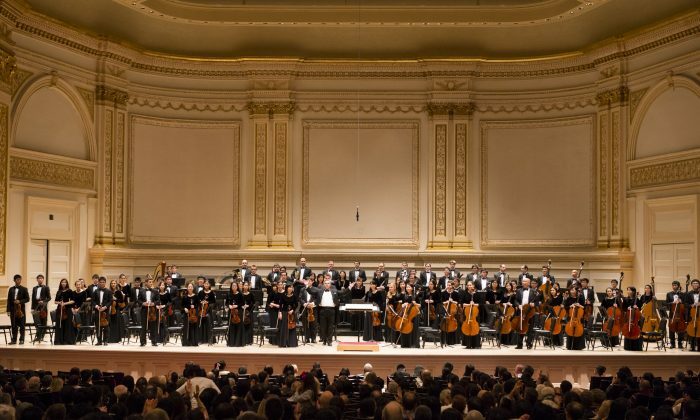 Being well acquainted with the fine arts of New York, for Mr. Smith a wonderful performance is common, but the orchestra’s performance at Stern Auditorium/Perelman Stage at Carnegie Hall on Oct. 5 was outstanding. “I totally love this,” Smith said, adding that he loved both the Chinese and European pieces. Shen Yun Symphony Orchestra has for seven years performed the musical accompaniment for Shen Yun Performing Arts, “the world’s premier classical Chinese dance and music company,” according to the orchestra’s website. For the performance at Carnegie Hall, pieces were conducted by Milen Nachev, Leif Erikson Sundstrup, Keng-Wei Kuo, and Yohei Sato. “The orchestra melds the spirit, beauty, and distinctiveness of Chinese music with the precision, power, and grandeur of the Western symphony orchestra,” the website explains. Mr. Smith, who has some musical experience himself, found himself enjoying Tchaikovsky and Beethoven alongside pieces featuring instruments like the Chinese erhu and pipa. The experience was one Mr. Smith wanted to share with more people. “I always encourage people to travel a lot because it improves your outlook on basically everything, so in that respect I think it’s wonderful that the orchestra should come here and give us the opportunity and give us the opportunity to hear this fabulous talent,” Mr. Smith said. Shen Yun Symphony Orchestra uniquely combined Eastern and Western music at Carnegie Hall Saturday. Musician Jules Levine was taking notes through Shen Yun Symphony Orchestra's performance Saturday evening at Carnegie Hall.